The latest Honda fuel cell concept keeps the overall rounded silhouette of the FCEV Concept shown at last year's Los Angeles Auto Show. But it ditches the full rear-wheel shield and opts instead for a partial panel that covers only the top of the tire. TOKYO -- Honda Motor Co. unveiled a sleek new concept of its upcoming hydrogen fuel-cell vehicle on Sunday, but promptly delayed its launch as part of a global quality review in the wake of a series of embarrassing product problems. Honda had previously said the environmentally friendly car would go on sale in Japan and the United States in the 2015 calendar year. It now aims to introduce the car to Japan by the end of March 2016 and bring it to the U.S. and Europe afterward. Honda said recently that it would review all planned product launches because of a rash of recalls plaguing the hybrid version of its redesigned third-generation Fit small car. The carmaker has said the extra quality checks will delay by three to six months the launches of six vehicles scheduled to debut in the current fiscal year ending March 31, 2015. Now the reviews are also delaying the fuel cell vehicle. “It’s because we are doing overall quality checks that we started due to the continuous recalls,” spokeswoman Yuka Abe said. “It’s not because this car has problems. Other cars already being delayed by Honda include the S660 mini sports car for the Japan market; the Grace, a Japan-market hybrid based on the City sedan; the StepWGN minivan; the Legend, the Japan-market name for the Acura RLX; an N-Series minicar for Japan and another minivan that has yet to be identified. The quality review may also delay the U.S. launch of the HR-V compact crossover to be built at Honda’s new plant in Mexico. In October, Honda announced its fifth Fit recall in just 12 months and took the unprecedented step of appointing the company’s first quality czar to clamp down on the problems. The carmaker’s top executives also took pay cuts for three months to take responsibility for the recall-plagued car. President Takanobu Ito ordered a revision of the company’s r&d process that inserts a prototype earlier into the research stage to test how independently developed parts work together in a full vehicle. Before, Honda never actually pulled components together until after research was done and development underway. The r&d redo will increase the cost and time of developing cars at Honda, just two years after a sweeping r&d overhaul aimed to speed localization and better tailor cars to local markets. 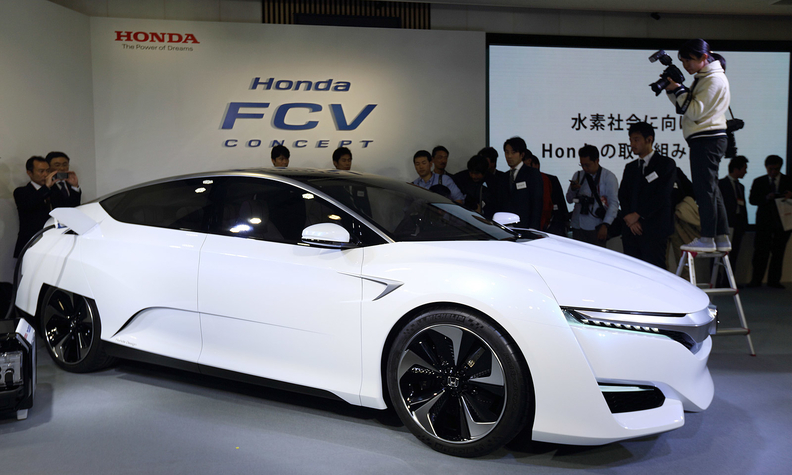 The delay is a small setback for Honda’s fuel cell project. On Sunday, Ito unveiled a new closer-to-production fuel cell vehicle design, dubbed the FCV Concept. It features a low, wide aerodynamic body accented by heavily creased character lines. Engineers delivered interior space for five occupants, instead of four as in Honda’s previous generation fuel-cell car, by devising a more compact, yet more powerful, powertrain. Honda’s hydrogen entry is being previewed as rival Toyota Motor Corp. launches the production version of its own fuel cell car. Both Japanese automakers are turning to the water-emitting green car technology, instead of pure electric vehicles, as their long-term alternative to gasoline-powered transportation. Honda aims to bring its car to market in Japan by March 2016 and then introduce it in the U.S. and Europe. Toyota’s car goes on sale soon in Japan and in the U.S. and Europe next summer. Honda executives declined to give such details as a more specific launch window, price range or production volume. But Honda says its offering will be the world’s first fuel cell sedan to fit the entire powertrain under the hood, freeing space for five seats. Toyota’s car, the Mirai, seats only four. “The downsizing of the powertrain greatly contributed to the achievement of this,” Chief Engineer Kiyoshi Shimizu said. The latest Honda fuel cell concept keeps the overall rounded silhouette of the FCEV Concept shown at the 2013 Los Angeles Auto Show. But it ditches the full rear-wheel shield and opts instead for a partial panel that covers only the top of the tire. The concept also sports an all-glass panorama ceiling. The front fascia also retains the vertical gill slits that frame the headlamps and fog light apertures. Meanwhile, the headlamps and position lights get blue tinting that telegraphs a technical, environmentally friend aura. The chrome wrap-around belt-like grille imbues a bold Acura-like expression. In tandem with Honda’s fuel cell launch, Honda also planned to announce a blueprint for supporting the expansion of a public hydrogen refueling station network in California. The lack of a fueling infrastructure is seen as one hurdle to the widespread adoption of fuel cell vehicles. The cars are also very costly to build, making lofty sticker prices another issue. Honda says it has re-engineered its fuel cell stack to fit completely in the front engine compartment to save space. Honda’s previous fuel cell car, the FCX Clarity, had the stack running partly down the center tunnel of the car, relegating that slope-roofed sedan to a four-seat configuration. The new stack is 33 percent smaller than the FCX Clarity’s. But despite being more petite, it is also more efficient, with a 60 percent increase in power density. Honda targets a one-tank range of 300 miles and refueling time of three to five minutes. The new system puts the stack under the voltage control unit in the front engine compartment along with the traction motor. The lithium ion battery sits under the rear seat, and a hydrogen tank goes over the rear axles. Honda has said it made the stack four times more robust in case of collisions. It did this partly by turning the stack sideways to make it shorter and wider, instead of tall and narrow as in the FCX Clarity. It also reinforced the stack's casing. Honda introduced its first-generation fuel cell car, the FCX, in 2002 and followed that with the FCX Clarity in 2008. The company touts the FCX Clarity as being the world’s first hydrogen car built on a dedicated fuel-cell platform, instead of relying on an existing production vehicle with its engine ripped out and a fuel stack wedged in. It delivered a 240-mile range. In June 2013, Honda and General Motors announced plans to jointly develop next-generation fuel cell systems and hydrogen storage technologies, aiming for a 2020 rollout. Shimizu predicted limited volume sales for Honda’s next fuel cell vehicle, but declined to offer a forecast. He said that more substantial volumes should be reached when the following generation car, the one planned with General Motors, arrives around 2020. Honda unveiled the car along with two external accessories. The first is a Honda Power Exporter Concept. It operates as a power feeding device that customers can plug into their fuel cell vehicle and use as a generator to power external devices. Outside Honda’s headquarters, the company ran a makeshift sidewalk cafe from Power Exporters hooked up to an FCX Clarity. The company also showed a Smart Hydrogen Station, which is a pre-packaged and compact hydrogen-generating machine. Honda bundled the car, power feeding device and hydrogen station together as part of its concept for covering three main needs of a hydrogen-powered society: Generating the hydrogen, using the hydrogen and then connecting the car to the grid.